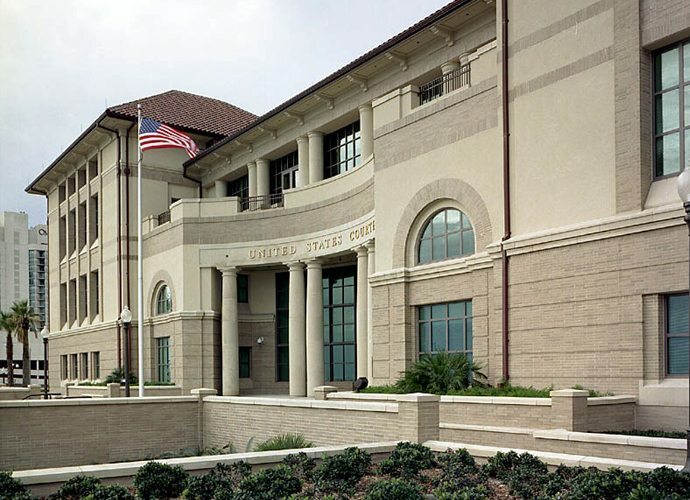 The project consisted of designing a four-story courthouse for federal courts in the Corpus Christi Division of the Fifth Circuit, Southern District of Texas. This new facility houses two district, two magistrates and one bankruptcy courtroom, and chambers for five active judges and one visiting judge. Additionally, the facility accommodates relocation and consolidation of spaces from three other buildings for the U.S. Marshal’s Service, U.S. Pretrial Service, U.S. Probation Service, and the Clerk’s offices. Other amenities include a central jury room, a grand jury suite, shared conferencing facilities, and attorney lounges. The project is located on the inland side of the Intracoastal Waterway and required high design wind loads. The concrete frame required special analysis and design to conform to GSA Blast Resistant Guidelines and high design wind loads. The facility was also designed to deter terrorist threats by maintaining standoff distance to mitigate blast effects from a vehicular bomb. Various types of barriers were also utilized to deter terrorists. However, preservation of view corridors and orientation of the entrance toward the bay and major public ways were key considerations. Costo: $23 millones US dls.